HUGE PRICE REDUCTION...Fantastic opportunity to own 2 homes on 1 lot. Live in one, rent the other or use entire property as your own. 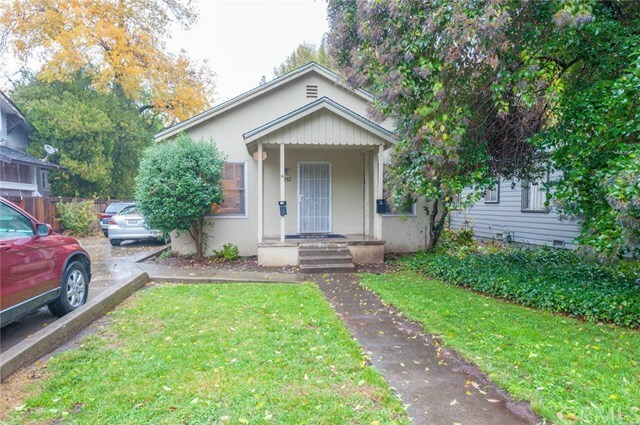 Great location close to CSUC and Downtown Chico. Both units were updated 2 years ago. The front house is comprised of 3 bedrooms and 2 bathrooms with a large open living area and a spacious dining room. Gorgeous wood floors flow throughout the house. The kitchen has been upgraded with subway tile, newly painted cabinets and new countertops. The same upgrades adorn the bathrooms. Laundry is located inside, close to the kitchen and bedrooms, all of which are very generous in size. The adorable studio has the same upgrades as the front unit and includes a kitchen, bath and sleeping quarters. Both homes have their own yard for privacy. As an investment purchase, this property has excellent rental history, but would also be great as a multi family home. Currently the front unit is rented for $1850, with rent increasing to $2000.00 in July. The back unit currently is $650.00 with rent increasing to $700.00 in July. DO NOT MISS OUT ON THIS OPPORTUNITY FOR POSITIVE CASH FLOW. MAKE YOUR APPOINTMENT TODAY!!! Directions: On Warner between W 2nd and W 4th avenues.